This multicolored bouquet delivers a wide assortment of garden blooms. 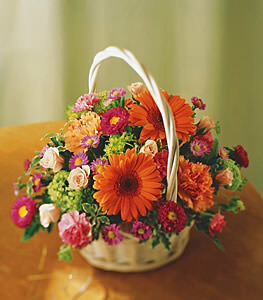 Orange gerbera daisies, pink spray roses, orange carnations, purple asters and more are sweetly arranged in a handled basket. A terrific way to brighten someones day.